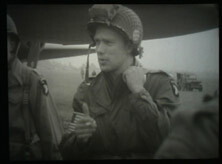 This DVD about the 101st Airborne Division takes place in World War II during the Fall of 1944, Europe. On August 16th, 1944 the 101st Airborne Division, also known as "Screaming Eagles", was assigned to XVIII Corps of the First Allied Airborne Army. The division was stationed in England after their return from the "Normandy Invasion" and preparing for the next airborne operation. 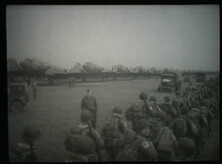 Our Series II DVD, Liberation of Western Europe begins here and continues until late November 1944. 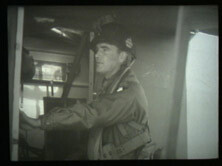 The contents of this video show the action as was recorded by the Signal Photo Companies of the 21st Army Group, during this historic operation. The military history footage in this video is intended to be strictly that of the 101st Airborne Division and only shows other unit footage when two or more units are intertwined. Combat Reels has researched and compiled all of this raw combat film footage, then reformatted it into the DVD format for your viewing pleasure. Great for veterans, families, military historians and military enthusiasts, this DVD has many different scenes of 101st Airborne Division soldiers. Then Enjoy HEARING and seeing Lt. Col. Cole, along with other 502nd men, tell the story of the attack at the "four bridges" near Carentan. This is the FIRST sound recordings ever put on a Combat Reels DVD. 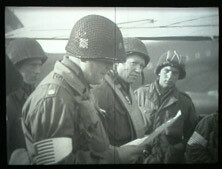 Watch 101st troopers of various regiments preparing for a jump in mid August, and then see Gen. Taylor award Silver Stars to soldiers in England for their actions in Normandy. 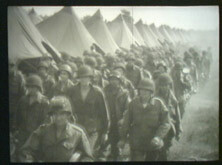 View the troops of the 101st Airborne as they prepare again to jump into Europe for Operation "Market Garden". Follow the men as they load planes and gliders to cross the Channel in a daytime jump over Holland. Watch the Dutch celebrate as men of the 101st land near Son and fight their way through the crowds in Eindhoven. The series closes with scenes of men loading British and American trucks in Nijmegen and driving along the dikes making a stop near Borg Leopold, Belgium. Bonus Footage: As a Special bonus enjoy some recently uncovered footage of D-Day Invasion not previously released in Series I, Invasion of Normandy DVD. 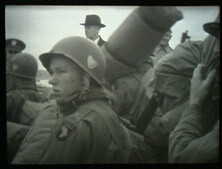 Begin with some scenes of D-Day and then view captured German footage showing 101st POWs at Normandy. 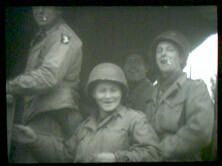 Watch a short clip / movie in Aldermaston, England of men of the 81st AB AAA Bn and 502nd PIR in a preview of this DVD. HQ men prepare for the Market Garden jump. 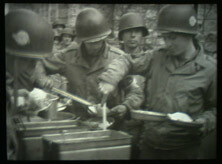 Artillery men get a hot meal. A 101st man saddles up. 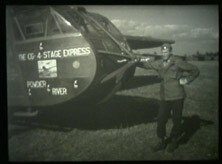 A Glider Infantry Man beside a Horsa. 502nd men check their equipment. 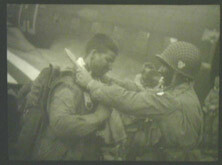 502nd PIR troopers prep for combat. Troopers begin their march after a rally at the drop zone in Holland. Men move out from tent city.